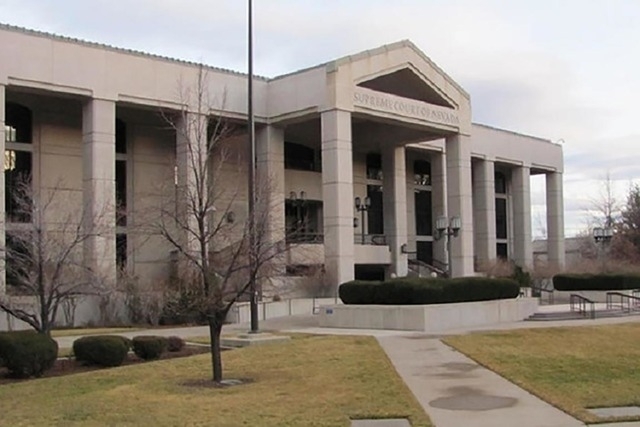 CARSON CITY — The Nevada Supreme Court questioned lawyers Monday on whether rules adopted by the state labor commissioner illegally allow employers to skirt a requirement to pay a higher minimum wage by simply offering health insurance. In a case that could affect tens of thousands of low-wage earners, justices are weighing whether a constitutional amendment passed by voters in 2006 requires workers to actually enroll for coverage — as opposed to just being offered it — to be paid $1 less per hour by employers. The amendment set a two-tiered minimum wage law — currently $8.25 per hour, or $7.25 per hour if workers are provided health insurance for themselves and their dependents through their employer. The measure also sets a 10 percent wage cap on the amount an employee can be required to contribute toward coverage. Justices are also considering if tips should be part of that calculation. More than a dozen lawsuits claim the policies made available by employers such as fast-food restaurants are of such low quality that they are basically worthless. Last year Carson City District Judge James Wilson ruled the regulations were invalid, but his decision was put on hold pending appeal to the state’s highest court. Arguments on Monday focused on the word “provide.” Does it mean an employer simply has to “offer” insurance to pay the lower minimum wage, as asserted by the restaurant industry? Or does a worker have to actually accept enrollment for coverage before the employer qualifies to pay the lower hourly rate? But Bradley Schrager, representing low-wage workers, countered that just offering insurance defeats the intent of the law, which was to encourage employers to provide insurance for workers. He described his clients as “the poorest workers amongst us” who are “giving up a dollar” in pay each hour. “We say the bargain is fairly straightforward. If you take the dollar, I get the insurance,” he said. The labor commissioner’s regulations, he said, create a “windfall” for the employer. On the issue of tips, Schrager argued they should not be included because they do not come from an employer but a customer. Senior Deputy District Attorney Scott Davis said regulations imposed by the labor commissioner set gross taxable income as reported to the IRS, which includes tips, as the index for determining the 10 percent cap an employee can be required to pay toward premiums. Justices took the arguments under consideration and will rule at a later date.